The Pope's personal theologian backed up the report in the Vatican newspaper. "Men and women sin in different ways," Msgr Wojciech Giertych, theologian to the papal household, wrote in L'Osservatore Romano. "When you look at vices from the point of view of the difficulties they create you find that men experiment in a different way from women." 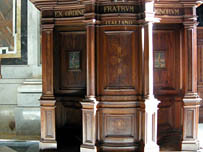 Catholics are supposed to confess their sins to a priest at least once a year. The priest absolves them in God's name. The Catechism of the Catholic Church states that "immediately after death the souls of those who die in a state of mortal sin descend into Hell". The Apostolic Penitentiary, one of the Vatican's most secretive departments, which fixes the punishments and indulgences handed down to sinners, last year updated its list of deadly sins to include more modern ones. The revised list included seven modern sins it said were becoming prevalent during an era of "unstoppable globalisation". "We are losing the notion of sin," he said. "If people do not confess regularly, they risk slowing their spiritual rhythm."